Pra Ngop Nam Oy Sugar-Cake Buddha Yantra Spell from Olden days Supannburi Master, Luang Por Jon, of Wat Noi in Supanburi. Luang Por Jon was the Abbot of Wat Noi during the years 2451 BE – 2485 BE, in succession after his Kroo Ba Ajarn the Great Luang Por Niam, considered the Great Master of the Wicha Ngop Nam Oy. The Pra Ngop Nam Oi of Luang Por Jon, of Wat Noi is made using the Wicha of his Kroo Ba Ajarn Luang Por Niam, who was the previous abbot of Wat Noi before Luang Por Jon. Luang Por Niam was one of the Greatest Master Monks of Olden Days, who was notably the Kroo Ba Ajarn of some of the mose Legendary Guru Monks in the History of Thai Buddhism, namely the Great Luang Por Parn of Wat Bang Nom Kho, and Luang Por Hnoeng of Wat Klong Madan. Luang Por Noi also was able to practice with Luang Por Hnoeng and Luang Por Parn, and was one of the Great Masters of his Era along with these Masters, in the same Lineage tree through Luang Por Niam. The Pra Ngop Nam Oy of Luang Por Jon is a perfect alternative to the extremely expensive and incredibly rare Pra Ngop Nam Oy of Luang Por Niam, which is beyond the reach of most budgets, even if possible to find one which is unlikely in the present day. 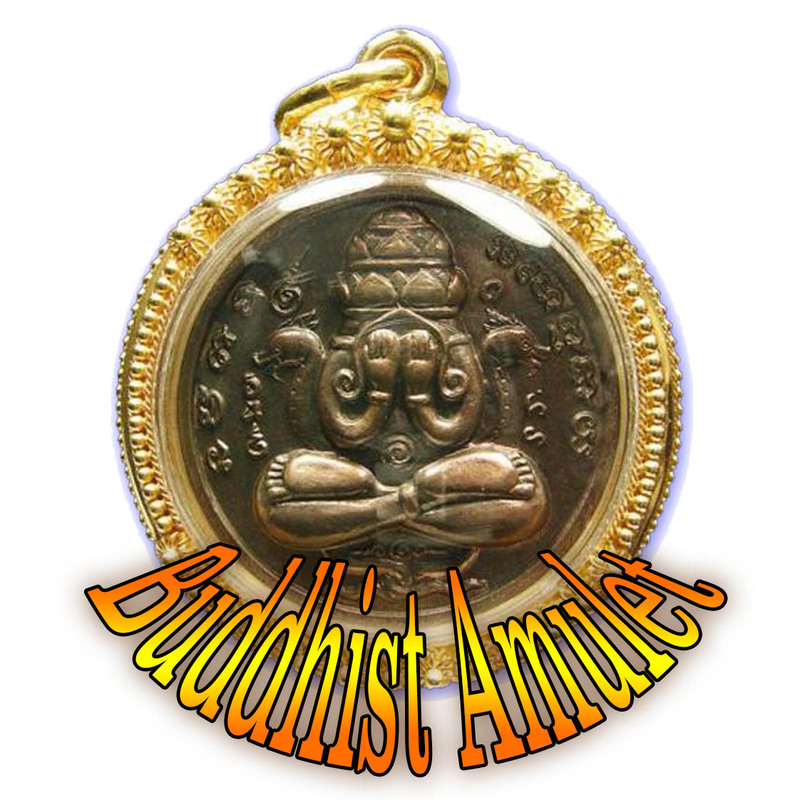 he Yant Ngop Nam Oy amulet is one of the most ancient types of Buddhist amulets, and is formed using a ring of Buddhas cascading outwards from a central point in a circle, resembling a Dhamma Wheel. 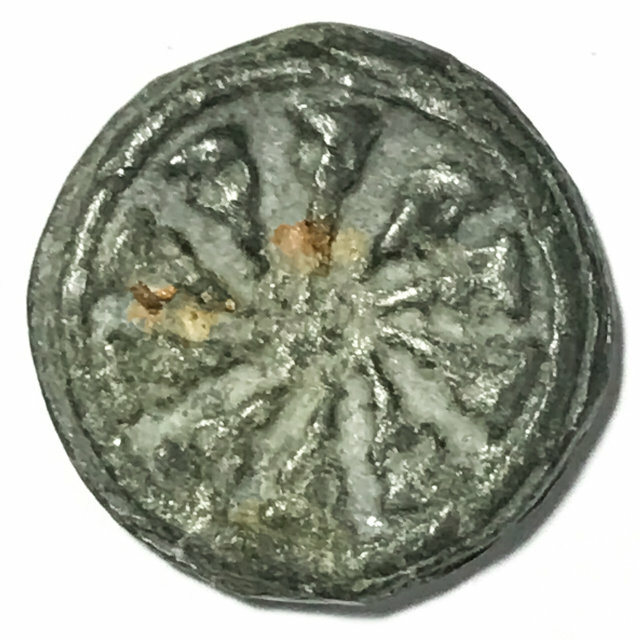 Found to be made both from letallic alchemical alloys, and also in powder clay forms. front side features a ring of ten outward pointing Buddhas, facing in all directions of the Universe, space and time, forming a Crystal Wall of Mercy and Protection around You. 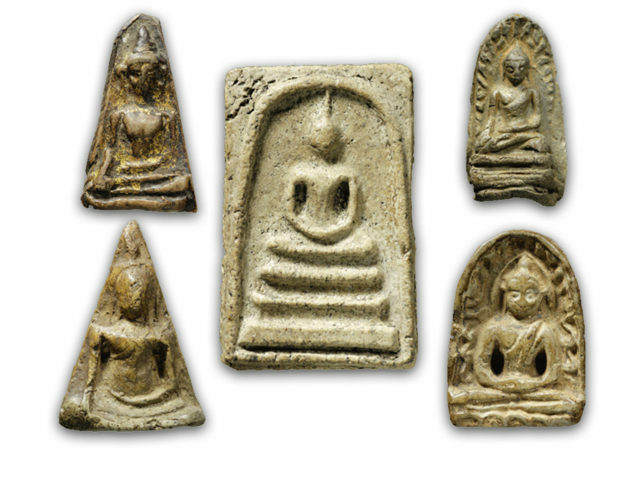 The Ngop Nam Oy amulet is purely Buddhist and void of Black Magick. In fact, this amulets is a very powerful Anti Black Magick amulet, as well as possessing immense Serm Duang Power to improve the Line of Fate, and Kong Grapan Chadtri and Klaew Klaad Protective Power. The Yant Ngop Nam Oi (Sugar cane Yantra) is a Buddha Mandala that resembles the traditional Sugar Cane cakes used as units of measurement in olden days (and indeed, still to this day in Thailand). The Yant Ngop Nam Oy was inscribed upon sugar cane cake in olden days, which was then immersed into the family water source, allowing all of those who drank from the source or the well, to experience increased mutual love and affection for each other, and increase Mercy Charm and Popularity for all. This happened through the Powerful Buddhakun Power of this Intrinsically Buddhist sacred Geometry Spell, which emanates Serm Duang, Metta Mahaniyom, Maha Lap and Kong Grapan Chadtri Klaew Klaad Power for Auspicious Fortunes.